Seaford01263 715779work01603 870304fax Self-cateringThe pretty village of Weybourne lies on the North Norfolk coast just 3 miles from the seaside town of Sheringham. Famous for The Muckleburgh collection you can experience a ride in a military vehicle, visit the museum and learn the history of this great collection.The area offers lovely coastal walks, sea fishing off the shingle ridge, or even a ride along on a Steam train on The North Norfolk railway, this location has something for young and old alike.Seaford is a detached brick and traditional Norfolk flint house, a beautiful high standard has been achieved on the refurbishment of the property, a lovely property for a relaxing holiday with a family games room to enjoy. • Outdoors: Fully enclosed garden with a summer house, lawn, patio and decking areas with barbecue, table and chairs. Outside front view of Seaford on a sunny day, with gravelled shared driveway. 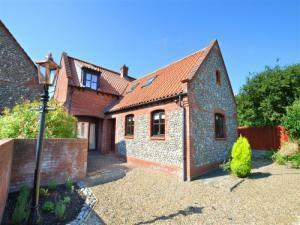 The pretty village of Weybourne lies on the North Norfolk coast just 3 miles from the seaside town of Sheringham. Famous for The Muckleburgh collection you can experience a ride in a military vehicle, visit the museum and learn the history of this great collection.The area offers lovely coastal walks, sea fishing off the shingle ridge, or even a ride along on a Steam train on The North Norfolk railway, this location has something for young and old alike.Seaford is a detached brick and traditional Norfolk flint house, a beautiful high standard has been achieved on the refurbishment of the property, a lovely property for a relaxing holiday with a family games room to enjoy.